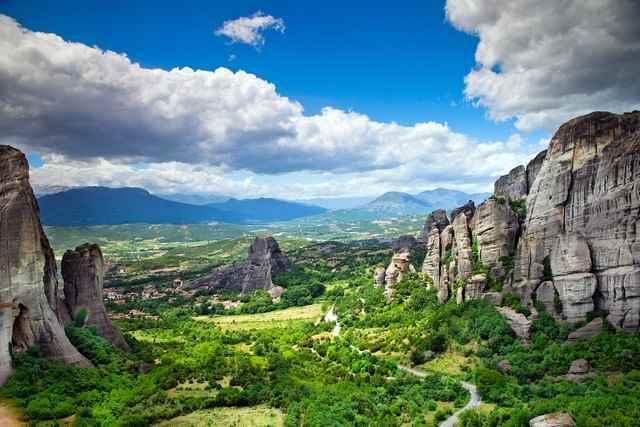 Meteora means ‘Suspended in the air' in Greek. The sandstone rocks look like they have been dropped from the sky. 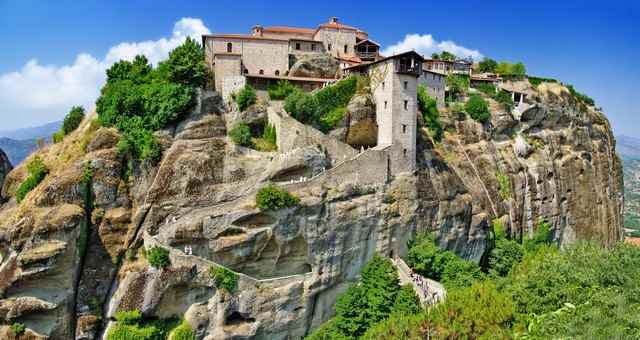 Rising 400m above the Peneas Valley, the monks thought that the position of the rocks was God's work, so they could be closer to him. 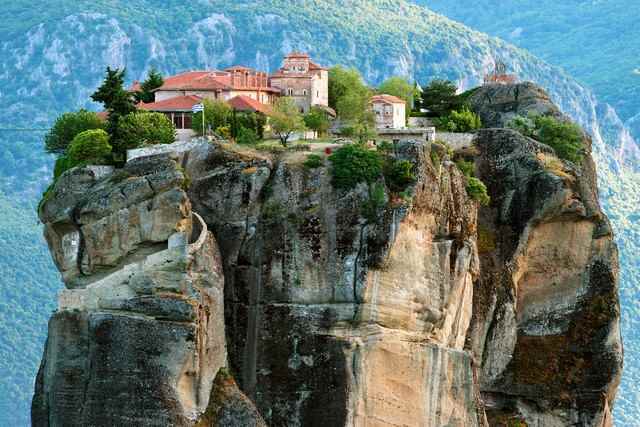 The first inhabitants of the Meteora, thought to be hermits in the 9th century, who ascended the rocks using scaffold wedged into holes, ropes and nets. 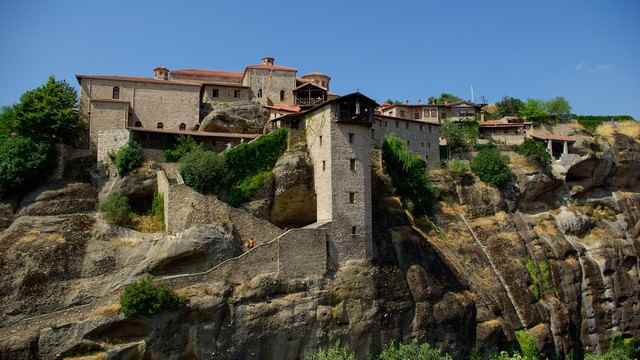 As early as the 11th century monks inhabited the mountains and began to build their monasteries. Working under impossible conditions, all construction materials were winched up in baskets. Until 1920 supplies for the monks were still brought up in this way. 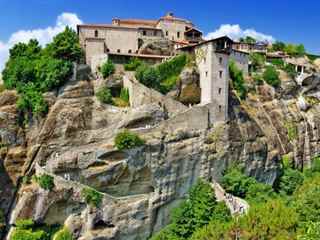 By the 15th century 24 monasteries had been built. Today there are only six left, with four, Aghios Stephanos, Aghia Trias, Varlaam and Great Meteoron, housing religious orders. Here, the Orthodox Religion has continued, uninterrupted, for over 600 years. 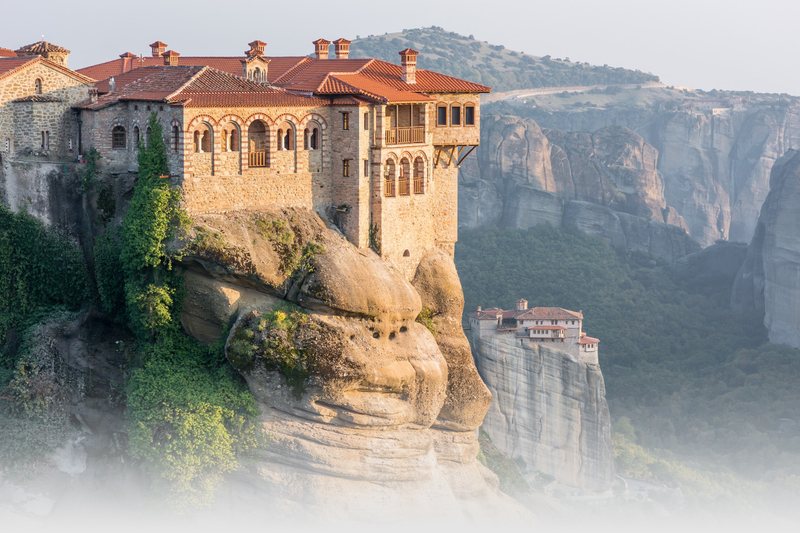 The monasteries represent a unique architectural and artistic achievement and are the 2nd largest monastic pilgrimage after Mount Athos. Chemical analysis of the rocks suggest that they were formed 60 million years ago in the Tertiary Period. Geologists believed that the rocks emerged from an estuary in a river that had been covered by the sea for millions of years. 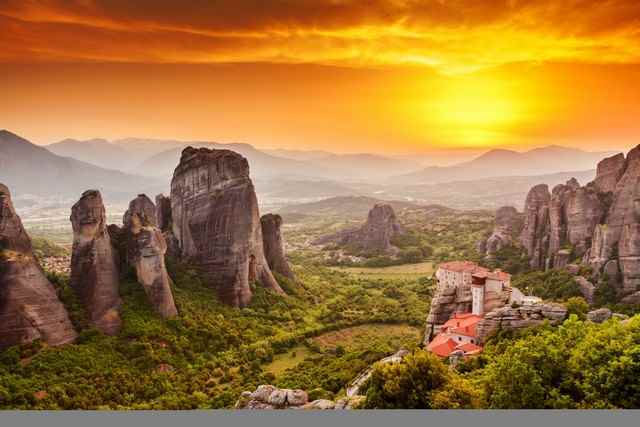 The Meteora are an enormous mass of sandstone and matter from all over Northern Europe. Seismic activity created faults and fissures causing the rocks to split and became individual columns. Your bus will pick you up from your agreed pick up point and at the time stated. We will drive south to the port of Lefkimmi. Ferry departure from Lefkimmi Port to Igoumenitsa Port is at 06.30am. Upon arrival in Igoumenitsa we will drive by air-conditioned coach to Kalambaka. 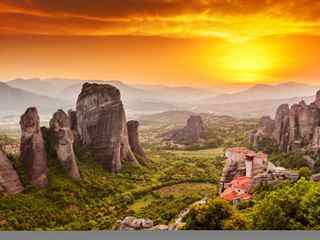 It is a 160 km drive (about 1,5 to 2 hours long) through Epiros on the Greek Mainland. The scenery is stunning with mountains, lakes and forests. 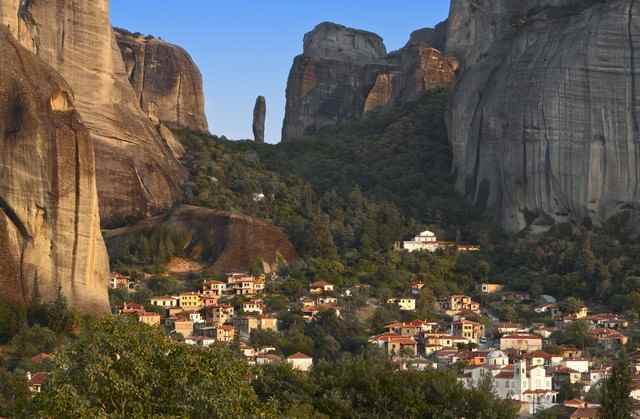 Arriving in Kalambaka we will visit a studio where holy icons are made and hand painted. The artists will demonstrate their work from the beginning to the finished product. You will be able to purchase icons from this studio. 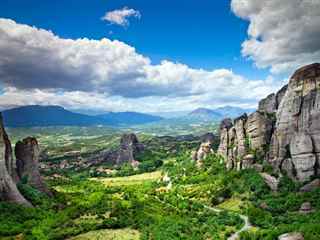 Later, we drive to the magnificent rocks of Meteora. 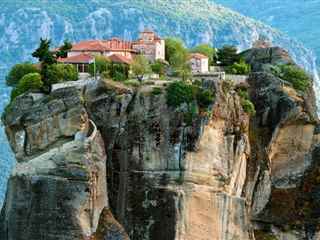 We will visit two monasteries. 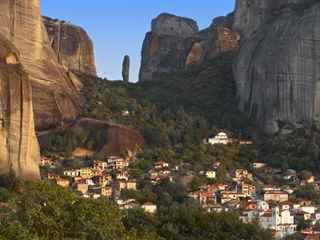 First is the Great Meteoron, largest monastery of Meteora. An hour guided tour will explain the unique building technique of the monastery, as well as the lifestyle of monks living there. 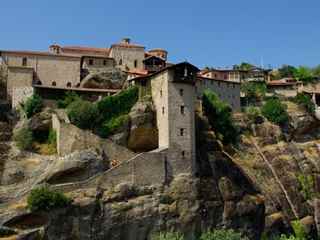 The second monastery we visit is one of the smaller ones, where we will also have an hour long guided tour. Our tour ends in a traditional Epirotic restaurant, where you can try many local specialties. The coach will leave Kalambaka at 16.30. The ferry departs from Igoumenitsa at 18.45 and arrival back to Corfu is about 19.45. 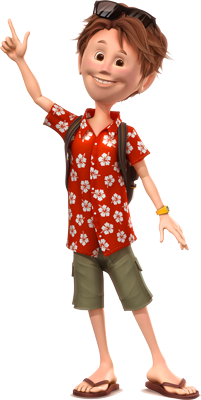 Your expected arrival at your resort is between 20.15 and 20.30. The tour start time depends on the resort that you are staying in. We recommend that you enter your mobile phone number during the reservation process in order for us to contact you in case of any change or possible cancellation due to weather conditions or other reasons. We would recommend you bring a bottle of water and a snack with you. Camera and video camera equipment may be used at all places of interest. In Monasteries you might need to purchase a pass in order to use your video camera inside the churches. Please ensure that you are suitably dressed to visit the monastery and the church (shoulders and knees, for men and women, should be covered). Long skirts and scarves are available at the entrance of each Monastery. This tour is rated as Informative and Cultural. There is a considerable amount of walking in this tour. The level of this tour is considered ‘moderate’. This tour is not suitable for persons with walking difficulties or with any other physical disability.